darkSpyro - Spyro and Skylanders Forum - The Legend of Spyro: Dawn of the Dragon - Overall Cinematic Effects - Did You Think They Were Good? darkSpyro - Spyro and Skylanders Forum > The Legend of Spyro: Dawn of the Dragon > Overall Cinematic Effects - Did You Think They Were Good? I didn't entirely judge the dang game's flaws, but I can see that this game was supposed to be EXTREMELY emotional. I've never played the game, but I've seen a walkthrough, and, from what I can tell, the game really TRIED to get that pump into us. It didn't play out so well, though, especially in the Belt of Fire Scene. but then for others, you'd see that there's like a quick slap face right there. In some cases, because of the lip design of Ignitus, when he'd gasp in shock, he looks to be SMILING. WHAT?!?!! Also, there were many instances in which there needed to be screaming and shouting, and Cynder's voice was not a good fit for ANY of those moments. Her voice was almost on the same tone throughout the entire game, and there were big shifts in the story plot. Her voice didn't match for any of those shifts. Really, I'm sorry to say, but Uncharted 2 did better than this game, even though it ain't satire. Although, the developers at least TRIED. Ignitus was more based on lazy design. They clearly couldn't be bothered/didn't have time to rig the model properly, which is why he's stuck in happy mode throughout the game. I remember being hugely disappointed with how his demise was handled to the extent I made a video back in the days with my version of how it should have panned out, to really pull at the player's heartstrings. As for Christina Ricci - As an actor, I think she's great, especially for certain roles (Wednesday Addams, anyone?) but Cynder... Not so much. There wasn't enough emotion there. 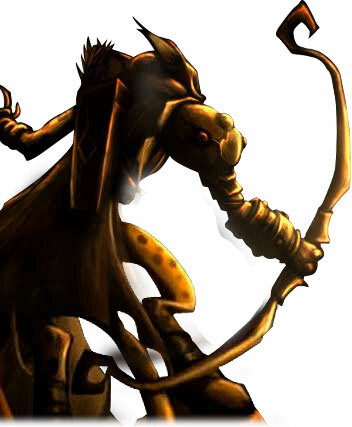 Then again, perhaps if they spent more time looking for appropriate voice actors instead of dragging in big name actors with little voice acting experience we may have had something so much better (I think Gary Oldman was the only voice throughout the whole game that I truly felt fit the character - All others were average/could easily have found someone more appropriate). Everyone had lazy designs that did no justice to their mostly good acting which was already hindered by the actual writing(c'mon,as tragic and sad Elijah Wood sounded all the damn time, he did a good job at keeping it consistent). As Razz mentioned a few times,Cynder has two knees in each of her hind legs (if her crazy hips weren't enough). The graphics themselves weren't half bad, but it takes a few looks to notice some things had textures slapped in with no second thought - look at the bones on Spyro's wings,or the plants in the picture. I still prefer Eternal Night's quirky-dark style even if the graphics were horribly outdated, though, because it gave life to the game as dark as it got; every time I stopped to look at another group of spiral branches in a tree or the crooked cave scenery, but I stopped paying mind to the scenery in DOTD after the first time since it was ripped striaght from your usual high fantasy artwork(not copied,mind you, but some things look like they were taken color palette by color palette from LOTR backgrounds to say the least). It's a bit overdone with the glossyness. I actually don't mind the glossiness. The glossiness expresses the color and the shining hope within Spyro. 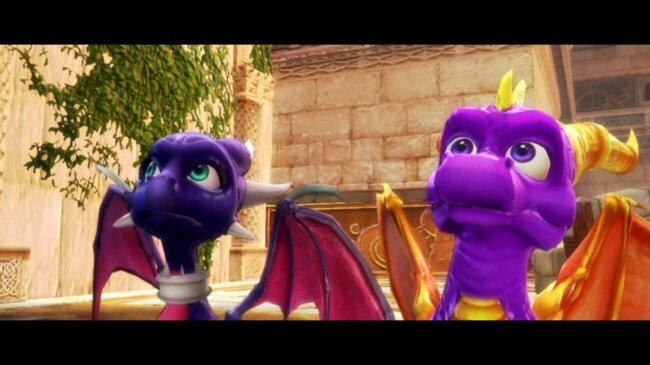 You can see how Spyro and Cynder's eyes when they see something there (I can't remember what are they looking at). Nah, I look at them as freaked out.